I get asked to judge a lot of competitions each year and it's a hugely rewarding and often humbling experience when I'm able to do it. Three is about my limit as they generally fall around the same time of year, so they coincide with the end of the academic year. Competitions are really a mild celebration of triumph over adversity and allow us to get closer to the maker or artist. I have tremendous respect for anyone who offers their work up for scrutiny by a panel of judges; trial by jury may be the fairest way to reach a decision but it's often the public vote that will have the final word over the judges. 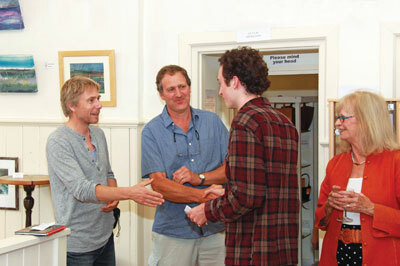 The Somerset Guild of Craftsmen's annual competition is one such event. The Guild currently have their headquarters and gallery based in Somerton, the ancient capital of Wessex and has a County-wide membership of over 160. The competition is open to colleges and furniture making schools in the local area, namely Bridgwater College, Bristol College and Williams & Cleal. It was a pleasure and honour to team up with Tom Kealy to judge the competition this year. I've got to say I felt like a bit of an imposter travelling across three counties and, therefore, three Guild neighbourhoods - including my own in East Sussex - to get there. Those sort of distances give plenty of time to ponder and, naturally, I'm wondering if each Guild could/would be tempted to run a series of regional competitions culminating in a 'best of' show held on neutral territory. The Somerset Guild is one of the oldest Craft Guilds in the country and has been promoting excellence in design and craftsmanship for 80 years. All their makers are skilled, dedicated craftsmen who have undergone a stringent selection process before becoming accepted as exhibiting members. At the time of writing, the Somerset Guild has plans to expand its catchment area beyond the Somerset boundary. It's an ambitious plan and not without some obvious logistical nightmares. Making the trip twice, one to deliver and one to collect, to display work is less tempting the further the distance. Ask anyone who's exhibited at the Celebration of Craftsmanship in Cheltenham or the Millinery Works, London. Both are great venues and typically feature some of the best bespoke made pieces in any given year. 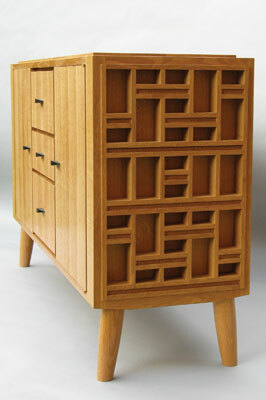 The winner on this occasion was Charles Byron with his take on a Japanese medicine cabinet in the style of a log stack. Take a closer look and you should agree that both parts of the brief have been fulfilled. In terms of surprises this piece just keeps on giving. The finish was impeccable, the craftsmanship faultless and the attention to detail thorough. Good cabinetwork should be a given for a winning piece but what did it for me was the plain white lacquered drawer boxes. Not a bubble, a run or a ripple just clean, clean, clean all over. Gallery standard. The piece began with a desire to highlight the beauty of end grain, drawing inspiration from both a traditional Chinese medicine cabinet and a simple log stack. Charles utilised a unique end grain oak (Quercus spp.) 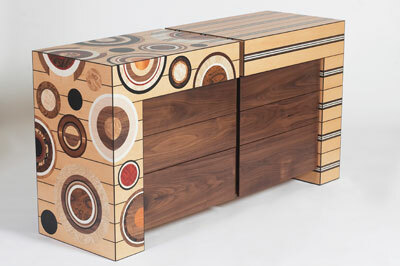 veneer to create the illusion of each closed drawer being a single piece of timber. 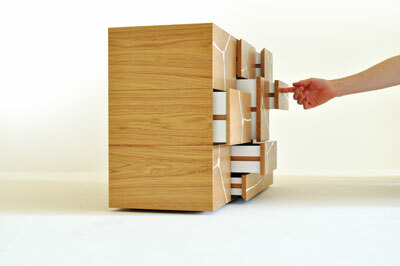 White resin fills the fractures in the veneers on the drawer fronts. The run of the grain transmits to the back of the carcass, aligning the crown with where it would appear in a log stack if the drawers were faces of a single block of wood. 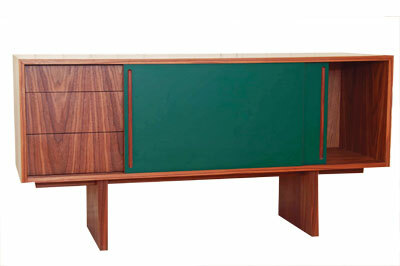 The handles were dictated by the veneer. On display Charles' 'Log Stack Cabinet' was the first piece you see as you enter the gallery space. It was the last piece Tom and I looked at. The decision was unanimous; best in show. Judges are looking for a degree of excellence in as many criteria as are suited to the range of work on display; my default being 'gallery standard' and by that I mean, would I be prepared to pay the asking price if it were on display in a gallery? It's a benchmark standard that takes into consideration things like composition, craftsmanship, finish and concept. None of these qualities I feel are subjective and can be assessed fairly and squarely against the rest of the competition. Personally, I like surprises. Diving into drawer cavities to see the guts of a chest is a good place to start. Climbing around the back and underneath is another. Sometimes what you're looking for is the best in the room and not necessarily the best you've ever seen, although that sometimes happens. Christine Meyer Eglestone and Ian Cresswell spring to mind. 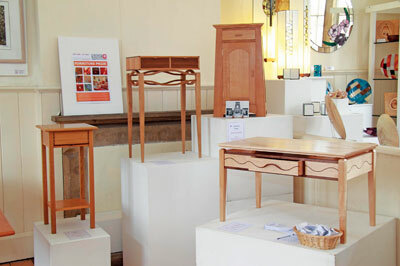 Winner of the Somerset Guild of Craftsmen judge's choice and popular choice award 2015 was Byron & Gomez, a partnership committed to producing furniture of the highest quality. Trained in traditional craftsmanship at the Williams & Cleal Furniture School, the company acquired a flare for contemporary design and innovative pieces that do not compromise on function.